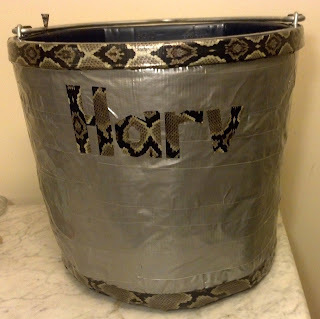 Remember my insulated bucket test? I blogged about it and promised to do an update. This is the update -- too bad the season is almost over! The bubble-wrap bucket works great. I have this bucket and another bucket fitted with a bucket cozy, which cost $40. The insulation properties are comparable, especially considering the bubble wrap bucket has no "topper." But to give my bubblewrap bucket a fair playing field, I cut a piece of cardboard to fit the top 2/3 of the bucket, wrapped it with bubble wrap and duct tape, and voila -- identical performance. I use the topper when it is under 20 degrees at night. I like to help with Harv's care when I can, and I usually fill water buckets while the horses are out. On days that are super cold, this does not work so well (water freezes). Then I started filling his buckets with hot water, then covering the buckets with a stadium seat cushion to keep them warm. This works great, and the buckets are still steaming hot when Harv comes in 3-5 hours later. The cozy has some advantages -- like you can use it on different buckets. But the bubble buckets are easy-peasy -- easy to handle, easy to clean, lightweight, and of course, cheap. I'm glad to hear this worked! I'll have to keep it in mind for next winter! Strange as this is, science has proven that hot water will freeze faster than cold.